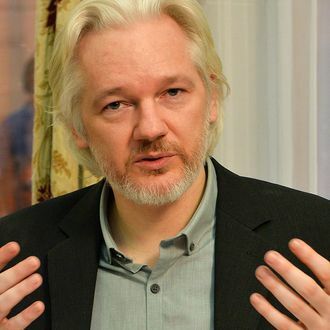 In the past three years, Julian Assange has only left the Ecuadorian embassy in London via hologram, but on Tuesday leaked documents revealed that Ecuador considered some creative methods to break him out for real. According to slides obtained by BuzzFeed, potential escape plans included making the WikiLeaks founder Ecuador’s representative to the U.N.(though the General Assembly could revoke his status), taking him away in a diplomatic car (but British police are “located in the hall, on the stairs, and the exits of the lifts,” that lead to the vehicle), and stuffing him inside a diplomatic bag used for documents (nixed because the Brits have “advanced technology that can detect body heat”). There was an even more dramatic option: “Assange could go out in disguise, attempt to cross the roof to the nearby helipad or get lost among people in [the department store] Harrods.” It’s not clear where Assange was supposed to go after making his great escape, and apparently none of these options worked out. The only plan that’s had any success is Assange waiting out the statutes of limitations on the sexual-misconduct allegations made against him in Sweden.